In her new poetry collection, Lethal Theater, Susannah Nevison reckons with the rituals of violence that underpin the American prison system, both domestically and abroad. Exploring the multiple roles of medicine in incarceration, Nevison’s poems expose the psychological and physical pain felt by the prison system’s inhabitants. Nevison asks readers to consider the act and complications of looking—at the spectacle of punishment, isolation, and interrogation, as mapped onto incarcerated bodies—by those who participate in and enforce dangerous prison practices, those who benefit from the exploitation of incarcerated bodies, and those who bear witness to suffering. Unfolding in three sections, Nevison’s poems fluidly move among themes of isolation and violence in prisons during periods of war, the history of medical experimentation on domestic prisoners, and the intersection between anesthesia used in hospital settings and anesthesia used in cases of lethal injection. Lethal Theater is an attempt to articulate and make visible a grotesque and overlooked part of American pain. “Chamber,” and “Where We Are,” in The Los Angeles Review. This rich debut collection explores the psychic states compelled by physical imperfection or abnormality. 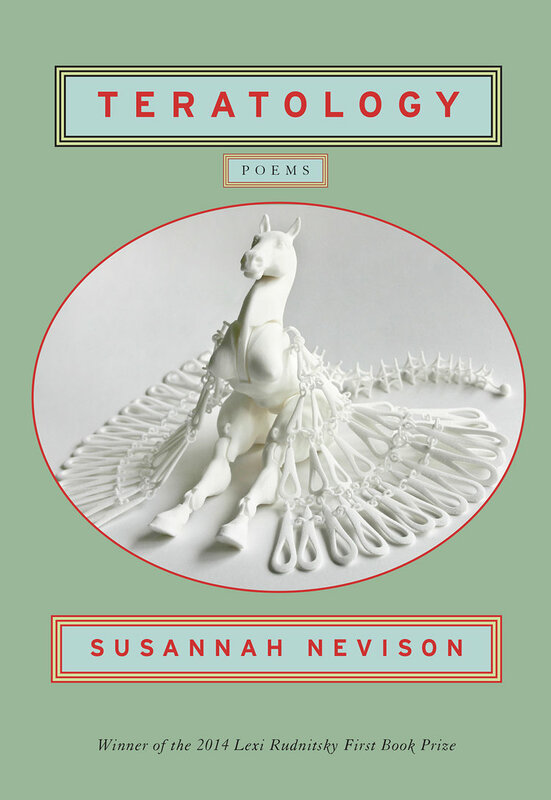 Set in vivid yet unsure spaces, like those between consciousness and anesthesia or dream, Susannah Nevison’s poems name and reclaim the body, making and unmaking it, portraying the “marvelous monsters” that we all are—whether outside or in. Unflinching and brave, Teratology marks the emergence of a highly imaginative and compassionate poetic voice. “Bestiary,” and “On the Physiology of the Heart,” on The The Poetry Blog. “Open my body,” and “Self-Portrait as Marshland,” in Diode Poetry Journal. In the Field Between Us is a collaborative project between poets Molly McCully Brown and Susannah Nevison that tackles questions of identity and belonging in the aftermath of lifelong medical intervention. An epistolary sequence of poems that comprises a dialogue between two disabled speakers, the book traces their struggle to find purchase in an increasingly inhospitable landscape. As the poems unfold, the speakers encounter a natural world that begins to mirror the trauma they have faced, and must continue to face, in their search for a true point of origin.